There’s something about this raw lady being inside you that causes mind shudders of pleasure. One day/night (oh memory) I was hungry and still had to wait for the spaghetti squash to reach spaghettihood when I saw those innards stretched out across the cutting board. So exposed and wanting, nay, begging to be inside me. 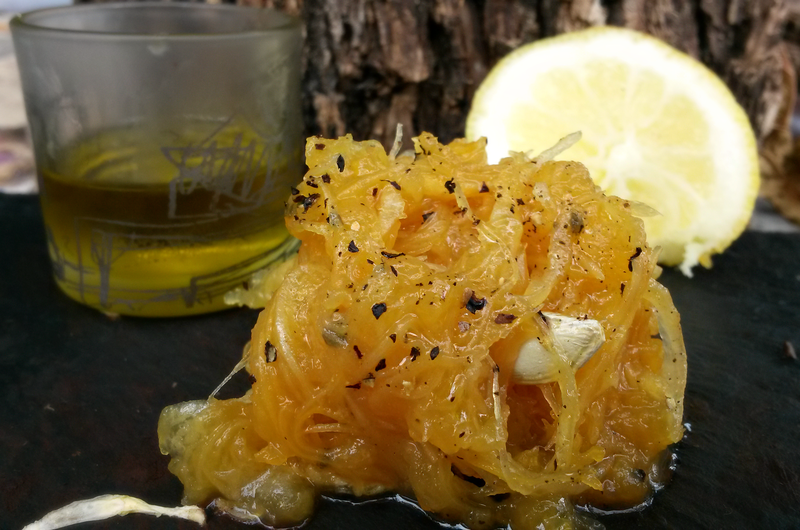 I rubbed them in oil and built up their tension while searching for the perfect spices. The wait was too much and I went classic. They had waited long enough and were immediately drenched in lemon juices and brought to completion with pepper and salt. The perfect substitute for spaghetti and meatballs has been approved by mu mouth. 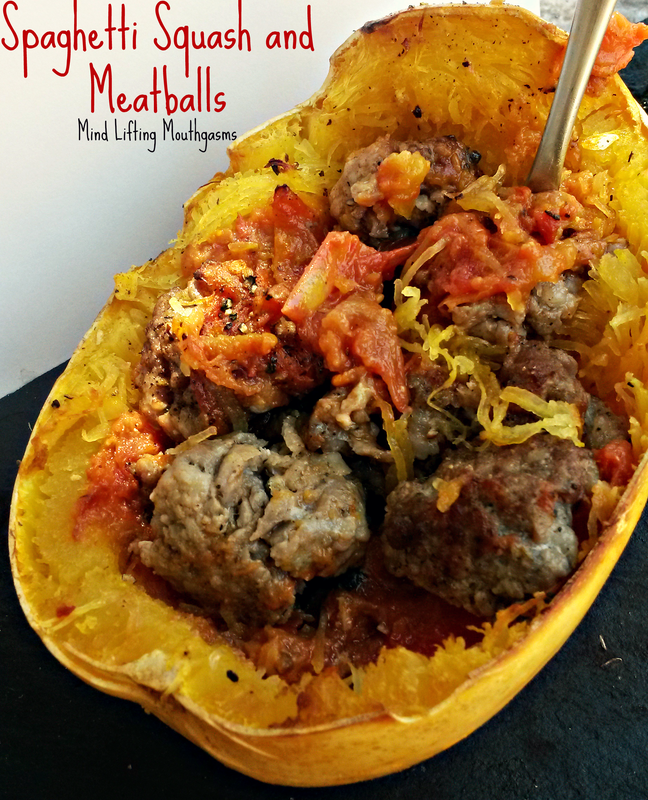 This spaghetti squash and meatballs bowl is so easy and so delicious. It even takes just as much work as pasta if not less. Just pop your squash into a slow cooker, or the oven, and cook up your marinara when it’s near ready, and combine. I even use the spaghetti squash as a bowl and just pull the noodles out with my fork as I eat. Many people just toss in a jar of marinara or spaghetti sauce, but I highly request you try making it fresh. You’ll get to choose your own flavors, the fresh taste bursts through, and it is so much fun to cook. You even get to use a wok, but a high sided pan works just as well if you don’t have one. The tomatoes and spices here really reach some earthy and satisfying notes with that Italian brightness we’ve come to love so much. You want to salt the meatballs after they’re in balls to keep the moisture in. Let your meat rest for thirty minutes for even temperature heating and because Alton Brown says to. 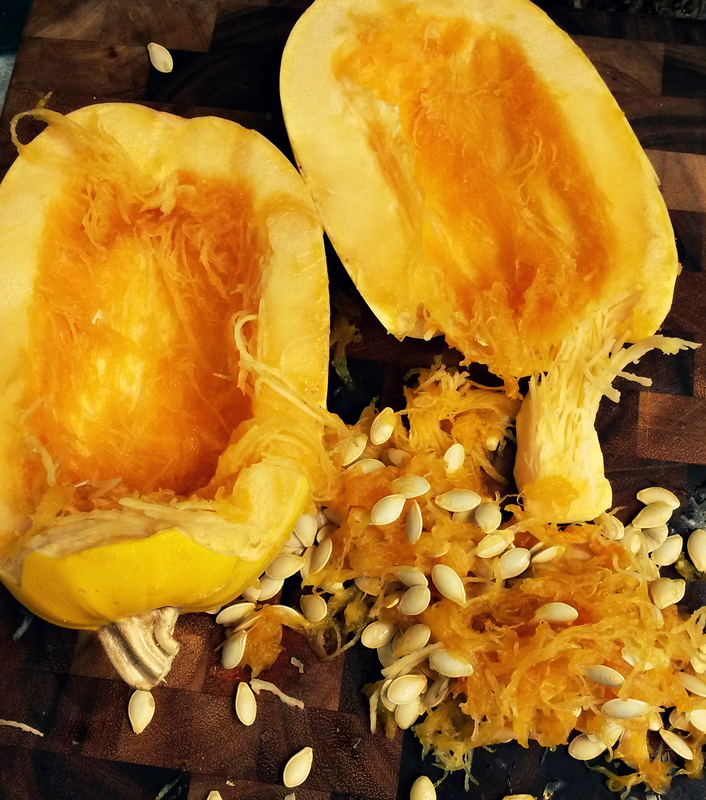 Preheat oven to 350 degrees and prepare your spaghetti squash (cut in half, scoop out seeds and add oil). You can also poke 10 holes in your squash, pop the whole squash into the slow cooker and cook on low for 4 to 6 hours. Heat up your oil in a wok or high sided pan. Once heated sear meatballs on all sides. Remove the meatballs from your wok/pan and set aside. Put the spaghetti squash into the oven and set a timer for 30 minutes. Create the marinara sauce and when you get to ‘simmer for twenty minutes’ add the meatballs and stir the sauce over them. Remove the squash after 30 minutes and let cool for about five minutes minimum (this is as long as I ever wait). 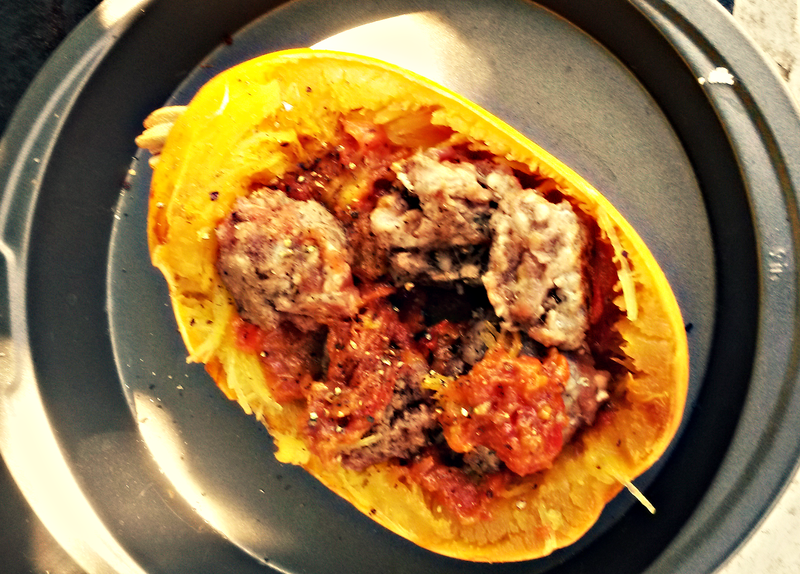 Fork about half of the squash into strings and add in your sauce and meatballs. 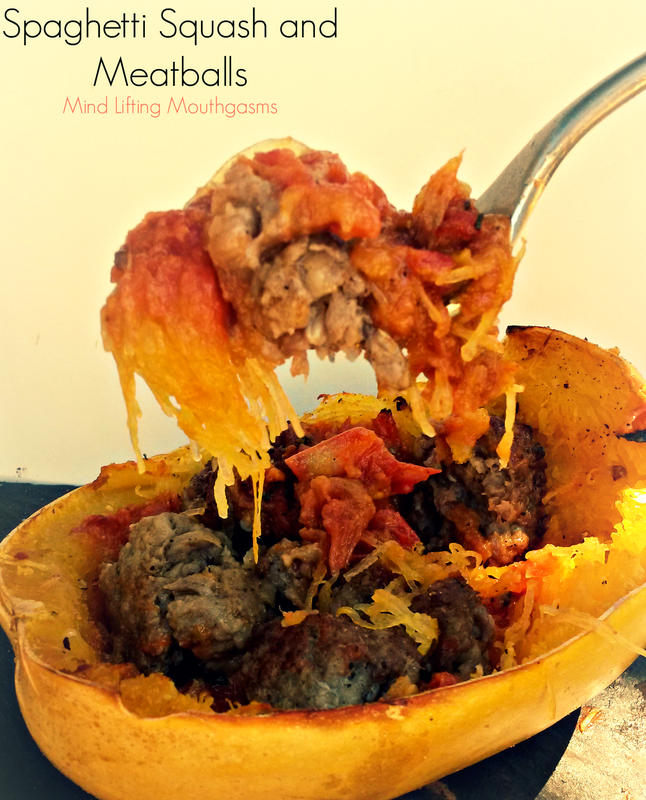 Combine your squash, marinara and meatballs. Put onto a baking pan or any pan and reheat for about 18-23 minutes. Add more oil if you want it to be more saucy.